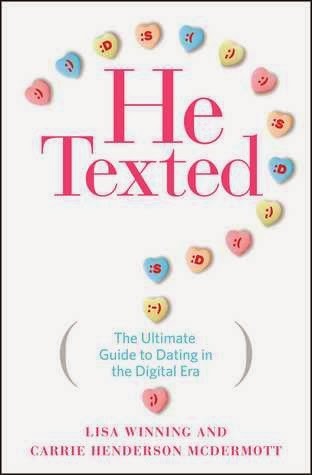 From Goodreads ~ The He’s Just Not That Into You for the iPhone generation - a frank, funny, and refreshingly helpful guide to dating in the age of social media from the creators of the wildly popular blog, HeTexted.com. Today, where everyone is plugged into social media 24/7, lines are blurred and a ton of new confusion exists about whether or not a guy is into you. As any woman who’s recently been on a date knows, no one leaves home without his or her phone and it is literally on the table or in use at some point on every date. So how can women use social media and texting to their advantage and suss out his true feelings? He Texted is here to clear up any mysteries about texting, friending, following, liking, LOLing, and poking that have become commonplace in the smartphone era. Founders of HeTexted.com Lisa Winning and Carrie Henderson McDermott and their stable of “Bros” go through the most common and confusing romantic cyber situations using actual text exchanges. Offering concrete advice, they’ll explain what’s really going on in each scenario on a practical and emotional level, lay down a verdict about the guy’s intentions, and establish clear-cut rules for any present and future conduct. Hilarious and helpful in equal measure, this is the book that everyone who texts, Tweets, or uses Facebook should own. I like reading about social media so this book caught my eye. It's about how people today date with their phones and texting. Dating sure has changed! The chapters cover different topics and include getting friended on FaceBook and what to have on your timeline, group texting, "abbreving" (using abbreviations rather than putting the effort into using words), sexting, lying, using emoticons (apparently not cool for a guy to use them), booty texting, getting dumped by text and the appropriateness of saying "I love you" for the first time by text rather than face-to-face. Each chapter is set up by the authors who give their opinion. And then three resident "bros" give their input. The chapter ends with "wants" and "do not wants". I have a work-issued cell phone. I'm not much of a cell phone user and I don't do a lot of texting. My Kobo Arc is always in my purse and that keeps me connected if I want to be to check Facebook and emails where there's WIFI. It drives me crazy that the younger generations are so addicted to their cell phones and texting ... walking along the sidewalk or crossing streets with their heads' down not caring if they are going to walk into people or get hit by cars. It's sad to see couples out for supper and both are spending their time with their phones rather than each other. Or dads at baseball games with their sons but they are paying more attention to their phone. Put the phones down, folks, and enjoy who you are with! I tried to like this book but I'm not a fan. As I said, I don't text a lot and I can't imagine hiding behind my phone if I was dating. Plus I found that the depiction of women made us seem desperate and pathetic and men seemed like slimy dogs and losers. As a head's up, the language at times is for mature readers. I do text a lot, but I don't text when I am out at a restaurant with someone or anything like that. It's rude.